//Some issues regarding design choices & labor costs & how they affect the overall quality of the knife are discussed in the video. //After a year to reflect on the Spyderco Karahawk, impressions of the knife have improved. Originally I did not think much of the knife but given the chance to compare the knife to other folding Karambits in the market the Karahawk has better design in a few regards & comparing the Karahawk to other folding Karambits is the best way to evaluate whether or not to buy the knife. 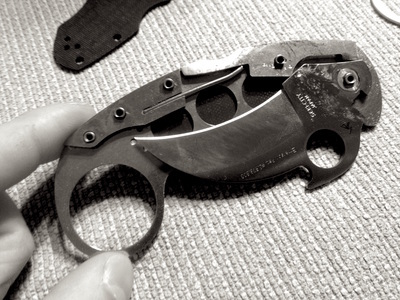 By itself there are some definite corners cut in labor, but easy of use & convenience make this knife more preferable over knives such as the Fox Folding Karambit. //For self defense it's not recommended to try to put your finger into a metal hole during a ﻿fight as that can be tricky if in a high intensity moment. The Handle material provides good traction. Deploying in reverse grip with the wave feature requires practice but very quickly becomes second nature.The wave hook is positioned in just the right spot that catching it on the pocket is easy. Also the design of the handle and position of the finger ring makes it easy to situate your hand for grabbing the knife out of pocket. This is very intuitive design & makes deploying the knife have many facets. 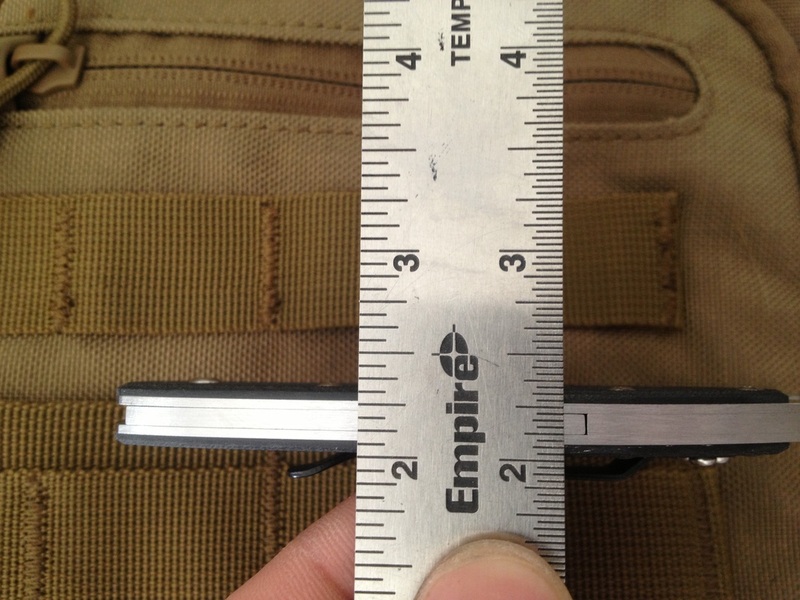 The blade shape is great for general EDC tasks but is a bit short. //For self defense the knife will be destined to become a favorite for both fans of unique Spydercos and also martial artists that enjoy using Karambits. Among many of the competitor options, the blend of design features on the Karahawk make a very good Karambit folder if not the best. For EDC the knife can still be utilized as the origins of the blade shape come from agricultural work, so gardening or general utility the knife will be more than enough. For perhaps food cutting the shape is more challenging as the proper method of using it is to not use a cutting board but cut holding the object but for meat draw cutting is still very functional. //Noticeable unfinished surfaces can cause injury. The finger is made using the two steel liners but because they are thin pieces of metal and also because they lack any chamfering, the finger ring can injure your finger. A person can debur these sharp edges by using a diamond rod or other metal files and once that is done the knife is much more usable. Newer Karahawks appear to have resolved this issue slighty from factory. //Locking mechanism: When deciding to utilize the lock back mechanism instead of the typical liner or framelock, it is my speculation that Spyderco chose it for two reasons: the first because it allows for a slimmer profile, but more importantly because it's easier to have consistency when manufacturing that you will get a solid lock up that won't fail. Liner locks and frame locks (like th one used on the Fox Karambit) can be made very well and be very secure but because of the necessary attention to detail, even a slight variation can cause a lock that fails. The lock back has another added bonus which is safety. Because it is a lock back, the spring is always providing tension to keep the blade closed & so it takes a strong catch of the wave feature and also it has to be for noticeable length for the blade to open, otherwise the blade will be retracted back in. This is a great design for safety since it is a knife that has a wave feature which is facing towards the inside of your pocket when carrying. The bronze washers are both small and thin and on my personal knife one has split apart. //In the end I neither recommend or don't recommend it. It's something obviously Spyderco is intending to keep around if they can and they've put a significant investment into it. Ultimately this type of knife is both artistic and cultural, while also having a mixture of modern economics determining the quality. A person should try using a talon shaped knife in all their daily cutting tasks before judging the versatility of this blade shape. The blade design originates from agricultural workers so it is definitely usable for food preparation given the right cutting techniques. //If you do intend to use it constantly for EDC you're probably going to hate the sharp unfinished edges & want to modify it. If you want it to be perfect then it will require a couple steps and the correct tools otherwise an easy fix that works is just to debur (round off the sharp corners) the steel liners that make the karambit finger ring.